Venus. (2003). In P. Moore, Atlas of the universe. (6th ed.). [Online]. London: Philip's. Available from: https://search.credoreference.com/content/topic/venus [Accessed 26 April 2019]. "Venus." Atlas of the Universe, Patrick Moore, Philip's, 6th edition, 2003. Credo Reference, https://search.credoreference.com/content/topic/venus. Accessed 26 Apr. 2019. Venus, the planet nearest to Earth, photographed from the Mariner 10 space probe in 1974. When the Sun was cooler Venus may have had oceans and life may have appeared, but as the Sun grew hotter the planet's surface became scorched and covered by dense clouds of carbon dioxide. Venus, the second planet in order of distance from the Sun, is as different from Mercury as it could possibly be. It is far brighter than any other star or planet, and can cast strong shadows; very keen-sighted people can see the phase with the naked eye during the crescent stage, and binoculars show it easily. Yet telescopically Venus is a disappointment. Little can be seen, and generally the disk appears blank. We are looking not at a solid surface, but at the top of a layer of cloud which never clears. 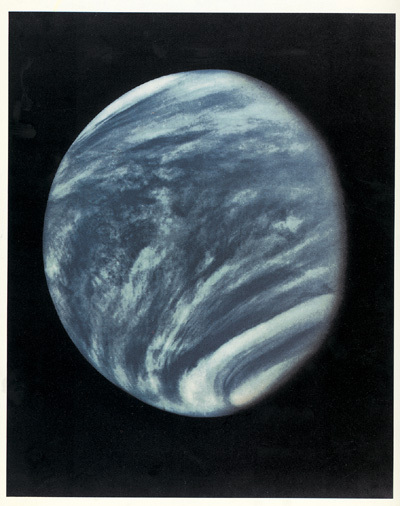 Before the Space Age, we knew very little about Venus as a world. We knew the size and mass; Venus is only very slightly inferior to the Earth, so that the two are near-twins. The orbital period is 224.7 days, and the path round the Sun is almost circular. Estimates of the rotation period ranged from less than 24 hours up to many months, but the favored value was about a month. 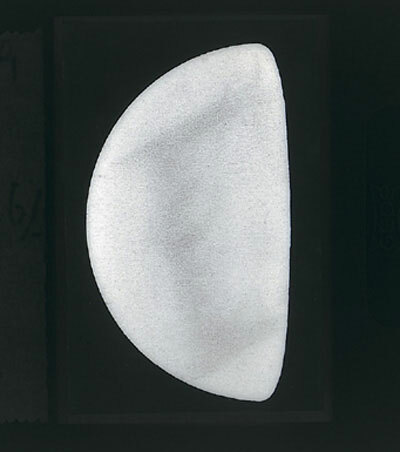 The vague shadings sometimes visible on the disk were much too indefinite to give any reliable results. There was also the Ashen Light, or dim visibility of the ‘night’ side, when Venus was in the crescent phase. It seemed to be real, but few people agreed with the 19th-century astronomer Franz von Paula Gruithuisen that it might be due to illuminations on the planet's surface lit by the local inhabitants to celebrate the accession of a new emperor! It was suggested that Venus might be in the condition of the Earth during the Coal Forest period, with swamps and luxuriant vegetation of the fern and horse-tail variety; as recently as the early 1960s many astronomers were confident that the surface was mainly covered with water, though it was also thought possible that the surface temperature was high enough to turn Venus into a raging dust-desert. Certainly it had been established that the upper part of the atmosphere, at least, was made up mainly of carbon dioxide, which tends to shut in the Sun's heat. The first positive information came in December 1962, when the American spacecraft Mariner 2 passed by Venus at a range of less than 35,000 kilometers (21,800 miles) and sent back data which at once disposed of the attractive ‘ocean’ theory. In 1970 the Russians managed to make a controlled landing with Venera 7, which transmitted for 23 minutes before being put out of action, and on October 21, 1975 another Russian probe, Venera 9, sent back the first picture direct from the surface. It showed a forbidding, rock-strewn landscape, and although the rocks are gray they appear orange by reflection from the clouds above. The atmospheric pressure was found to be around 90 times that of the Earth's air at sea level, and the temperature is over 480°C. Radar measurements have shown that the rotation period is 243.2 days – longer than Venus' ‘year;’ moreover, the planet rotates from east to west, in a sense opposite to that of the Earth. If it were possible to see the Sun from the surface of Venus, it would rise in the west and set in the east 118 Earth-days later, so that in its way the calendar of Venus is every bit as strange as that of Mercury. The reason for this retrograde rotation is not known. According to one theory, Venus was hit by a massive body early in its evolution and literally knocked over. This does not sound very plausible, but it is not easy to think of anything better. It has been found that the top of the atmosphere lies around 400 kilometers (250 miles) above the surface, and that the upper clouds have a rotation period of only 4 days. The upper clouds lie at an altitude of 70 kilometers (44 miles), and there are several definite cloud-layers, though below 30 kilometers (19 miles) the atmosphere is relatively clear and calm. The atmosphere's main constituent is indeed carbon dioxide, accounting for over 96 per cent of the whole; most of the rest is nitrogen. The clouds are rich in sulfuric acid; at some levels there must be sulfuric acid ‘rain’ which evaporates before reaching ground level. Venus drawn with my 31-cm (12½-inch) reflector. All that could be seen were very vague, cloudy shadings which are necessarily rather exaggerated in the sketch, together with slightly brighter areas near the cusps. The terminator appeared essentially smooth. 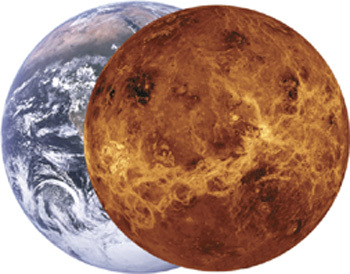 The internal structure of Venus may not be too unlike that of the Earth, but with a thicker crust and an iron-rich core which is smaller both relatively and absolutely. There is no detectable magnetic field and, like Mercury, Venus has no satellite. Venus from Mariner 10. This picture was taken on February 6, 1974, one day after Mariner 10 flew past Venus en route for Mercury. The images were taken in ultra-violet light; the blueness is ‘false color,’ not the actual hue of the planet. The photograph was made by first computer-enhancing several television frames, and then forming a mosaic and retouching them. Note the difference in appearance near the planet's poles, which correspond to the cusps as seen from Earth. A chemical that is created when copper is exposed to the atmosphere. Copper oxide is not an insulator and creates no hazard.